Does your business have a handle on its policy enforcement? As outlined in our earlier post, charges of sexual harassment have always posed the potential for very serious liability. Historically, however, sexual harassment has been relatively difficult to prove from the legal perspective. That tide is turning, however, as technology and social media have armed victims with a much more effective medium for their voices to be heard: voicing concerns in the court of public opinion before heading to a court of law. This movement is not limited to the arena of celebrities and politicians. Is your business ready to respond appropriately? What if the allegations are against your CEO or other critical managers? Are you prepared to properly address such complaints and protect your business? 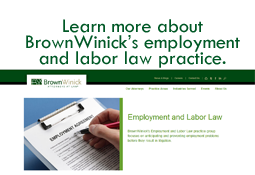 Given the spotlight being shined on these issues, and the importance of ensuring a safe work environment free from unlawful discrimination, we have prepared a series of blog posts focused on relevant considerations for employers. Our first post focused on the basics of required anti-harassment policies and reporting procedures. This is the second post of our series, which addresses implementing actual practices that comply with those policies and procedures. As we previously discussed, employers must have a current, compliant harassment policy. So then what do you do with this policy? Effectively communicate the policy. Employees must know not only that the policy exists, but also how it operates. Employees should be given the opportunity to ask questions. Periodic refreshers should be circulated, and a copy of the company’s anti-harassment policies should be re-distributed from time to time. Ongoing education and training on the policy. As a corollary to the importance of effectively communicating the policy, we must underscore the importance of conducting recurring workplace training on EEO policies. We recommend conducting training at least annually. Ideally, training would be conducted for all employees, as well as training geared specifically to supervisors (especially to help them identify potential red flags and how to properly handle complaints). We are beginning to see more C-Suite executives and board members seek out training opportunities; we believe this practice is not only wise, but particularly effective as conveying a consistent message about an organization’s commitment to equal employment opportunities. To best protect your business, the training should be live and interactive, rather than, for example, taking on-line training that involves reading instructional information and answering questions thereafter. The training element goes hand-in-hand with maintaining a current, compliant harassment policy. Consistent enforcement. The policy absolutely must be enforced, and it must be enforced consistently. Internal processes should be streamlined to ensure all complaints are addressed promptly. If an employee reports improper conduct in the workplace, employers must be committed to conducting a proper investigation by a trained investigator, and taking appropriate corrective action, up to and including termination of the perpetrator’s employment (even if it is the CEO). No retaliation. Employees who make or participate in making good faith complaints or who cooperate with an internal investigation must be protected from retaliation. These assurances should not only be relayed directly in the policy, but also repeated to employees real-time when they are actually engaged in protected activity. For example, if an employee raises an internal concern, the supervisor receiving the information should reiterate the company’s anti-retaliation policy, and encourage the employee to report any potential retaliation. Anti-retaliation reminders should be given, for example, when conducting witness interviews during an investigation, when carrying out disciplinary measures to correct an identified issue, and when following up with a victim after an investigation and corrective measures have been taken. Employees should be regularly encouraged to come forward with concerns about potential retaliation, and employers should continue monitoring the workplace to help protect against possible retaliation. Employers need to put themselves in the best position to respond to sexual harassment and other misconduct as quickly and effectively as possible.